Who’s afraid of the big, bad Heat? I’ll admit I had trouble with that sneaker commercial some years back that referenced Dwyane Wade. You remember: Fall seven times, stand up eight. How, after all, was he getting up that eighth time when he hadn’t fallen yet? I probably should have consulted Phil Jackson, given the apparent Zen interpretation of struggles that require resilience and perseverance. And that was Wade, who famously battled from Chicago’s South Side through a late blooming basketball career to transcendent NBA stardom. But as the Miami Heat come into the United Center Thursday for the final regular season marquee matchup with the Bulls’ Derrick Rose expected to return from his latest ankle sprain injury, the Heat is a stumbling, seemingly uncertain team. They are 5-5 in its last 10 and 3-7 in the last 10 road games. And while critics generally point to the lack of a true center, the lack of a true point guard, Chris Bosh’s inconsistency and still changing rotations — why exactly is this team so special, by the way? — it’s Wade who may be having trouble standing tall these days. Wade just turned 30 in January. But it’s been a tough nine years, two of which Wade was battered regularly in carrying the team as it stripped down to prepare to recruit LeBron James and Bosh. And Wade’s injury history is familiar and commercial inspiring. By his second season, he missed playoff games with knee and rib injuries. He limped back against the Bulls in the 2006 playoffs from a hip injury to carry the Heat to the championship and Shaquille O’Neal on his back. He missed much of the following season with a shoulder injury, and he didn’t get up, taken from the court in a wheelchair. Wade had serious knee problems the next season and sat out the last 20 games. This season Wade has been out four times with ankle, foot and calf injuries. It’s possible Miami’s biggest problem is this dynasty may be ending before it can begin because we’ve seen the best of Wade. That the problem isn’t James’ late game uncertainty or Bosh’s occasional indifference. But that the high flying, explosive Wade is becoming more and more ordinary. Well, not exactly Tyrus Thomas-like. After all, Wade is averaging 22.6 points, sixth in the NBA. So, yes, this still is a guy who gets into the game plan. 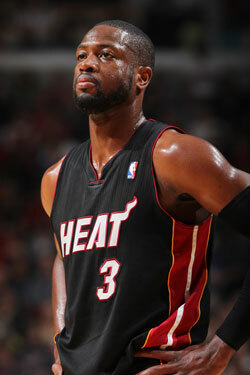 But even at 22.6 per game, that is the fewest Wade has averaged since his rookie season in 2003-04. Both Wade’s assists and rebounds are below his career averages, and the rebounding is third fewest in his career. He is averaging a career low 33.6 minutes per game. But his three point shooting also is at a five year low at below 28 percent. Though it’s more than pure numbers. It’s also the so called eye test. Wade has a lot of ordinary games. Three of his last six have been under 20 and he’s shot better than 50 percent once in the last seven, and that against Toronto. Wade also seems to have even further raised his on court sense of entitlement with almost constant complaining to officials over virtually every play. It sort of makes you sad recalling what a wonderful breath of fresh air and so uncomplicated he was when he came to the Heat and exploded on the playoff scene. Frustration over being unable to do what he did before? Or just stepping more because he knows LeBron will be sad if he isn’t the big star? Still, if you brag about falling down, eventually it does begin to ache to get back up again. Though it’s not directly related, I saw where Wade told ESPN Wednesday that NBA players should be compensated for playing in the Olympics. I’m assuming Wade has been relying on the Ozzie Guillen public relations manual. Maybe it is the Heat and humidity. Yes, Ray Allen first brought it up the other day, though he isn’t playing. It may not have been the most appropriate comment given we still have a war going on where the basic sergeant’s pay is about $2,000 a month with $225 extra for the combat zone. Wade is making about $15.6 million this season with five years left on his deal averaging about $18.7 million per year. So, yes, he may have been looking for some pin money with this the lowest paying season on his deal that ends in 2016 at $21.7 million that season. Wade did later try to explain with Twitter comments (what, no press conference like Ozzie?) saying he was just talking theoretically and loves playing for his country. But I do digress. This is about Wade and the Miami Heat, and there is come conventional wisdom that they are bored with the season and just saving it for a fluid playoff run. When you look carefully — and yes LeBron is terrific, I have to agree — there really does not seem to be that much there there. There are just a few games left in the season and they change the rotation almost daily. Ronny Turiaf, who only joined them a few weeks ago, starts at center. He remains more question than answer. Their other so called bigs have been small. Their point guards, Mario Chalmers and Norris Cole don’t shoot particularly well. Though they don’t dribble that well, either. Which is why you can have some success pressuring the guards. But there’s a downside there as the Heat is best in transition. So what you most want to do is pack it in against them. Teams have had success playing zone and getting them in half court. Plus, they aren’t a very good rebounding team, 18th in the league even as team president Pat Riley knows rebounds equal rings. It suggests a clear edge the Bulls have. Protect the lane and rebound. Keep them outside shooting. Eventually, the Heat go to a small lineup, which is worse for rebounding. But with Bosh at center and James at power forward they are more skilled. When Bosh is into it. He hasn’t much been since the All-Star break, averaging 16.9 points and 6.6 rebounds since then on just 46 percent shooting. Though Kevin Garnett did scare the heck out of him in two games. If you play him physically, he doesn’t always care for it. Home court advantage for the playoffs is at stake, and if the Bulls win one of these last two against Miami they realistically wrap it up. We know James is terrific. But if Bosh isn’t as much motivated and Wade isn’t quite what he was, well then just who is the Heat? No one is suggesting they cannot win the championship. But they are 3-3 this month and have lost two of their last three at home, giving up 115 points to Boston at home Tuesday. They’ve had four, blowout double digit losses in the last 10 games. There isn’t one way to win a championship. But I’ve seen championship teams finishing the season before and don’t recall many like Miami with their “We’re cool, we’ve got it,” attitude. Maybe they are that confident, that they know how good they really are and this unique season requires pacing yourself even more. Perhaps they understand better. Yet, other than James, who has been playing at a high level, it’s difficult to see why anyone else or the way they play would give you all that much trouble. Still, you have to prove it, and the Bulls get two more regular season chances. Next act: Thursday on TNT. You do begin to wonder if Miami has it in them to remain standing.